On Friday April 5, I went short natural gas futures. I shorted at a price of 4.11 at around noon. I have been travelling for nearly a month, hence my late entry and my scarcity. Today I am back at my home base. Anyways, I've been looking to short nat gas recently, and I had one blunder. It wasn't really a blunder, it was just a trade that got stopped out. It occurred about 3 weeks ago on the last run up. I tried to short it, but it turned out I was premature. I'm looking for a good run with this trade. Also, I had been looking for another short entry into the USDX. I had made a short entry into that market about a month ago, and I got stopped out at a very small profit. The trade is listed prior to this entry in my trading blog (which you are reading right now, and you can see the entries in the right-hand column, to your right). Another great shorting opportunity occurred recently in the USDX, but I missed it. So be it. It seems as though natural gas has had quite an up-run in price. Personally, I feel that its overbought, and has been for a month or two. Long story short, I've been looking to short and I've found a potential opportunity. Here is a daily chart for May 2013 natural gas futures. 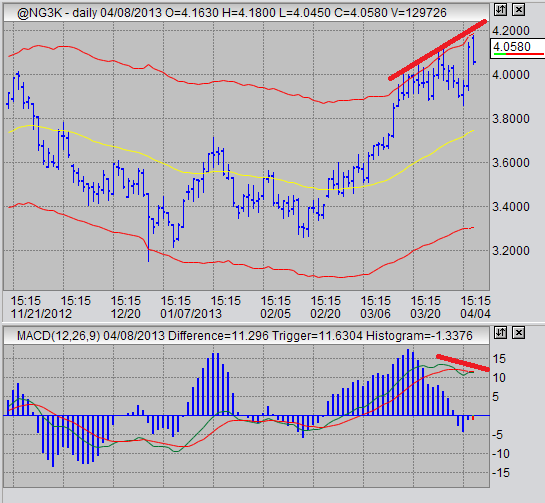 It seems pretty clear to me that there is an MACD divergence here, and an opportunity to short natural gas futures. Higher highs on the price, lower highs on the MACD. In addition, I don't see any sustainable bullish fundamental data going on. The fundamental data that caused this spring-time bull run was poor and overly speculative, at best. It just seems to me that we're due for a good downwards correction. Keep in mind, I am using stops to protect myself against counter-position market movements. I am aware of, and willing to acknowledge, that my opinion may be wrong or ill-timed. As such, I am taking precautions to avoid account-breaking losses should the trade work against me. I had been of a bullish attitude in sugar for the past several months. Now, however, I am no longer of that attitude. I had not traded aggressively in that market. In fact, I had hardly traded at all. I am still looking for a long position there, but with much, much, much reluctance and patience. I am still of bearish mind regarding the USDX. However, I am not sure I am willing to make a trade right now. I missed a good opening, and I'm not willing to chase the price. I was quite bullish in gold. Now I am not. I'm not bearish either. I'll probably just stay away from metals for a while, although I am considering shorting gold at some point.